This site is at about 13,450-foot (4,100-meter) altitude on the mountain. For scale, the rock cluster toward the bottom right of the image is approximately 1 foot (30 centimeters) wide. The image was taken in 1999 by R. E. Arvidson. Such ground texture has been seen in recent images from NASA's Mars Exploration Rover Opportunity. This late-afternoon view from the front Hazard Avoidance Camera on NASA's Mars Exploration Rover Opportunity shows a pattern of rock stripes on the ground, a surprise to scientists on the rover team. 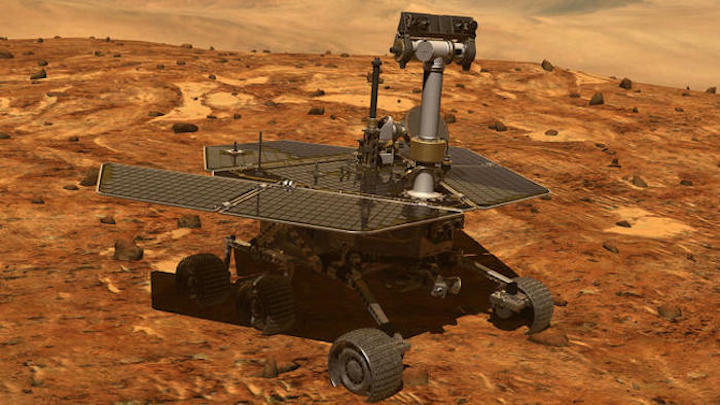 Approaching the 5,000th Martian day or sol, of what was planned as a 90-sol mission, Opportunity is still providing new discoveries. This image was taken inside "Perseverance Valley," on the inboard slope of the western rim of Endeavour Crater, on Sol 4958 (Jan. 4, 2018). Both this view and one taken the same sol by the rover's Navigation Camera look downhill toward the northeast from about one-third of the way down the valley, which extends about the length of two football fields from the crest of the rim toward the crater floor. The lighting, with the Sun at a low angle, emphasizes the ground texture, shaped into stripes defined by rock fragments. The stripes are aligned with the downhill direction. The rock to the upper right of the rover's robotic arm is about 2 inches (5 centimeters) wide and about 3 feet (1 meter) from the centerline of the rover's two front wheels. This striped pattern resembles features seen on Earth, including on Hawaii's Mauna Kea, that are formed by cycles of freezing and thawing of ground moistened by melting ice or snow. There, fine-grained fraction of the soil expands as it freezes, and this lifts the rock fragments up and to the sides. 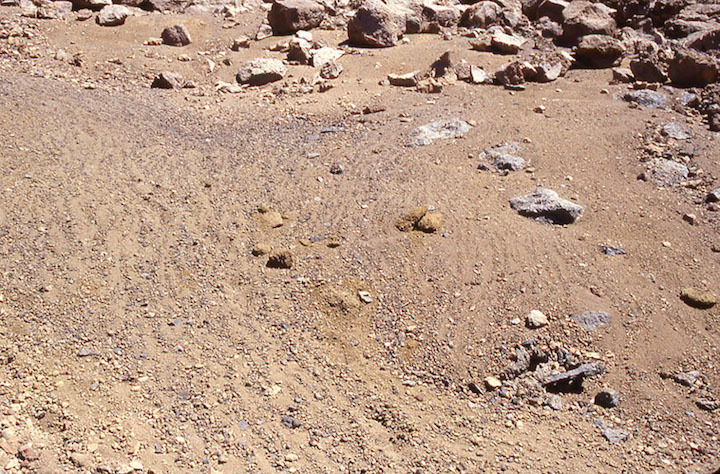 If such a process formed this pattern in Perseverance Valley, those conditions might have been present locally during a period within the past few million years when Mars' spin axis was at a greater tilt than it is now, and some of the water ice now at the poles was redistributed to lower latitudes. Other hypotheses for how these features formed are also under consideration, including high-velocity slope winds. Textured rows on the ground in this portion of "Perseverance Valley" are under investigation by NASA's Mars Exploration Rover Opportunity, which used its Navigation Camera (Navcam) to take the component images of this downhill-looking scene. The rover took this image on Jan. 4, 2018, during the 4,958th Martian day, or sol, of its work on Mars, looking downhill from a position about one-third of the way down the valley. Perseverance Valley descends the inboard slope of the western rim of Endeavour Crater. A view on the same sol with the rover's front Hazard Avoidance Camera includes ground even closer to the rover at this site. 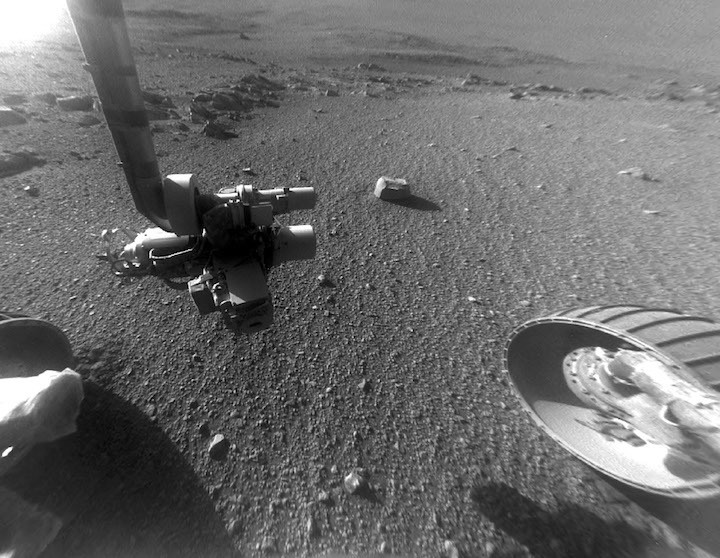 Opportunity was still working close by as it reached the mission's Sol 5,000 (Feb. 16, 2018). In the portion of the valley seen here, soil and gravel have been shaped into a striped pattern in the foreground and partially bury outcrops visible in the midfield. The long dimensions of the stripes are approximately aligned with the downhill direction. The striped pattern resembles a type of feature on Earth (such as on Hawaii's Mauna Kea) that is caused by repeated cycles of freezing and thawing, though other possible origins are also under consideration for the pattern in Perseverance Valley. The view is spans from north on the left to east-southeast on the right. For scale, the foreground rock clump in the lower right is about 11 inches (28 centimeters) in width.